In equal turns uplifting and bracing, Letters to a Young Poet is a collection of correspondence from poet Rainer Maria Rilke (1875 – 1926) to an aspiring poet aged 19, Franz Xaver Kappus. Rilke’s words are nurturing and inspiring to any vulnerable creative or young mind eager to shine. Your letter only reached me a few days ago. Let me thank you for the great and endearing trust it shows. There is little more I can do. I cannot go into the nature of your verses, for any critical intention is too remote from me. There is nothing less apt to touch a work of art than critical words. Nobody can advise you and help you, nobody. There is only one way. Go into yourself. Examine the reason that bids you to write. This above all: ask yourself in your night’s quietest hour: must I write? Rilke also urges balance between self-examination and self-obsession; and tackles how to write from the depths of sadness. Most of all, Rilke shows how human connectivity – not accomplishment – sustains our humanity. 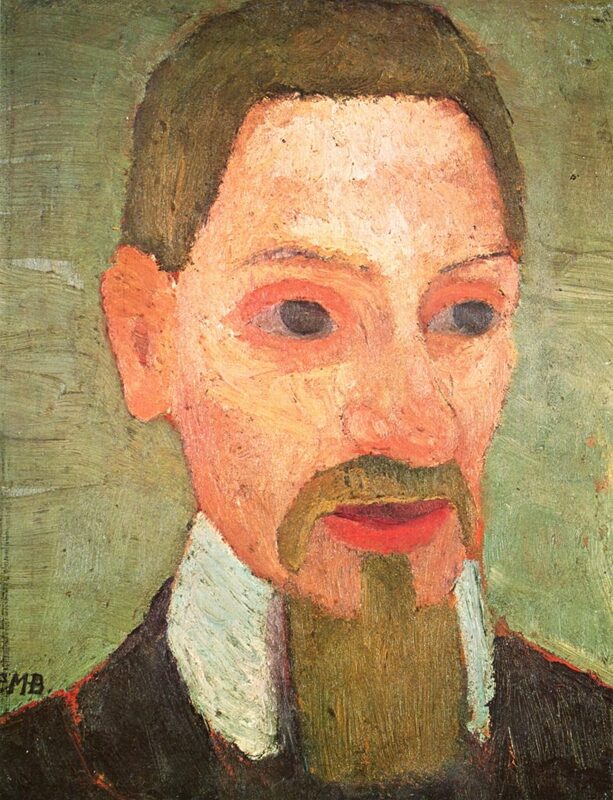 “Rainer Maria Rilke” (1906) by Paula Modersohn-Becker, a critical Expressionist painter and great friend of Rilke. Rilke’s belief that we require “existential anxiety in order to begin” that somehow soulful questioning is a gateway to self-knowledge and thus contentment, isn’t new. But no one put it quite so rapturously. Rilke’s writing is referenced frequently – more than other philosophers of his era – it’s difficult to believe that so much of it came from this thin epistolary. I believe Rilke’s current favor (like Hesse in the 70s) is because, above all, Rilke’s writing is extremely maternal and hopeful. It is directive, yes, but moreover, it is caring, nurturing and reassuring. You are so young, all still lies ahead of you, and I should like to ask you, as best I can, dear Sir, to be patient towards all that is unresolved in your heart and try to love the questions themselves like locked rooms, like books written in a foreign tongue. When asked to review poems, Rilke pushes that request aside and instead, gets to work on the poet. Focusing on the person, not the work, is an approach held in prestige by so many artists and writers (and certainly by this site). For additional insight on the self-forming nature of solitude dive into the meaningful, mournful poems of American poet Wendell Berry. On ballasting one’s young insecurity, read Maya Angelou’s warm, generous Letter to My Daughter. I often fish from the themes circling in Rilke’s work and he’s inspired many posts. Including one on the fear of being interrupted once we go into solitude, into self, and an existential restlessness we feel for something long gone.